List your off campus student rentals today for FREE. 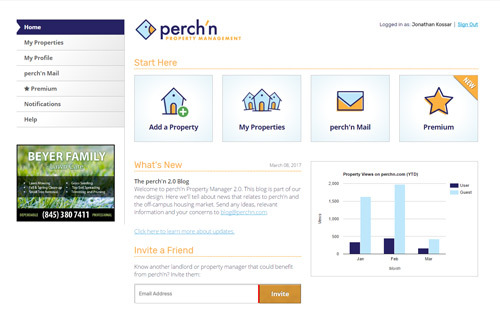 perch'n® helps Landlords reach renters looking for housing near colleges and universities. It's free. It's easy. And you may never put up a "For Rent" sign again. I have read and agree to the perch'n® terms and conditions. FREE Listings - Start listing rental properties with our Property Manager and instantly target potential renters. Upload up to 6 photos - Maximize your web presence by adding a main photo and up to 5 additional photos. On-Site Messaging - Communicate directly with potential renters to find the right group to lease your property.